When was the last time you got at least seven hours of sleep? Can’t remember? That could be a problem. And your boss could offer a solution. “The simple truth is less sleep does not equal more productivity. It is a fallacy,” he said. Under-slept employees (those who get less than six hours) can be less productive, creative and resourceful. They can also be more deviant and unethical. “The more likely they are to lie, falsify data, claim the work of other people, or falsify reimbursement claims,” said Walker, who has been studying sleep for 20 years. Underslept workers are also costly. They take an average of 11.5 more days of sick leave a year and often have higher health care costs. “Your immune system starts to implode on anything less than seven hours,” Walker said. So it’s in an employer’s best interests to promote sleep among employees. But making sleep cool again isn’t easy. Employees who brag about how little sleep they get are often seen as more productive and important. “It’s this macho idea that sleep deprivation is a proxy for strength and dedication and discipline,” said Arianna Huffington, founder of The Huffington Post and Thrive Global, a tech and media company that promotes wellness, in an email to CNNMoney. Here’s what some companies are doing to help create a well-rested workforce. Knowing your sleep needs and being able to change your habits to improve sleep can help you become a more productive worker. For instance, are you a morning lark or night owl? Walker created a company that assesses employees’ sleeping habits and needs. The Universal Sleep Audit is a digital sleeping mapping system that asks users a series of questions and then provides personalized results and suggestions on how to improve their sleep. The questionnaire takes less than 10 minutes to complete and the data is anonymous. “We can provide individualized personal sleep prescriptions,” Walker said. It includes tips like ideal bed times, when to stop drinking caffeine and the best time to schedule meetings. Employers also get an overview of the entire organization’s sleep habits, which it can use to better set schedules to help increase productivity. 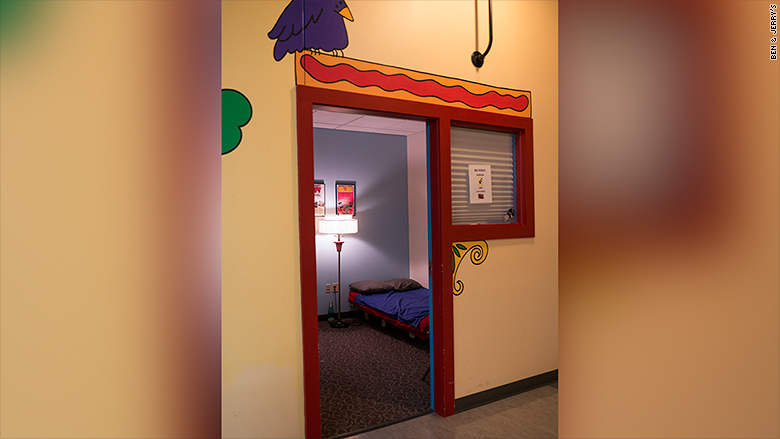 Ben & Jerry’s offers a nap room at its South Burlington, Vermont, offices. Companies are adding nap rooms or napping pods to their offices to give workers a space to recharge. That may sound great, but just because a room is available to take a quick snooze, doesn’t mean employees are taking advantage of it. Ben & Jerry’s has offered a small nap room at its offices in South Burlington, Vermont, for more than 10 years. The room includes a futon and blanket. The company used to have a sign-up sheet to reserve the room, but realized workers weren’t totally comfortable outing themselves for napping on the clock. “People would put funny names like Donald Duck, so we took down the sign-up sheet,” said Laura Peterson, a spokesperson for the ice cream company. There is a 20-minute limit. “If the door is closed you know it is being used. It is still appreciated more than it’s used,” she added. When it comes to changing the mindset around sleep, incentives are effective. “The vast majority of employees want to be seen as successful within the company, they want to get promoted and they want to get ahead. So they’ll do the things that are rewarded by the company culture,” noted Huffington. “That means companies need to make sure that prioritizing well-being and getting enough rest are incentivized by making it very clear that not getting enough sleep is not celebrated and rewarded,” she said. Casper, the company known for its mattresses that come in a box, gives employees up to $60 a month if they voluntarily log their sleep. All they have to do is enter how many hours of shuteye they got the night before. The funds are added to workers’ paychecks. The company also recently opened up The Dreamery in Manhattan. Guests can book a 45-nap in an individual nap nook for $25. The sheets are changed after each user, and the space is designed for napping. The goal is to bring the concept to company campuses.